Update 2017-06-11: Two more Plant Anatomy shawl patterns are available: Green Linen and The Indulgent Spirit. They are part of the second Plant Anatomy book, too! Last June, the book Plant Anatomy by Nehemiah Grew (published in 1680) inspired me to create a collection of shawl designs around this theme. 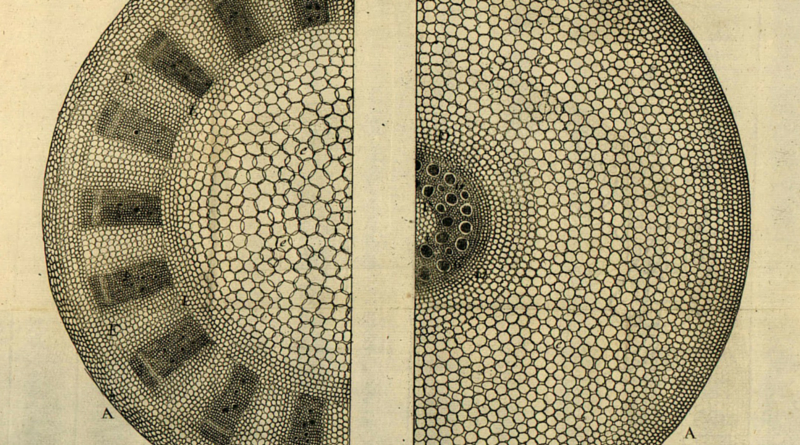 The book is full of detailed, beautiful illustrations of the microscopic anatomy of plants: mostly cells, and lots of interesting textures evolving naturally. I decided to create a shawl design collection and document the project from start to finish, providing you exclusive insight on the details of creation processes of ten different shawl designs, their compilation into a pattern collection and their final publication in book form. This is the main post for updates and documentation of the Plant Anatomy project. Additional links and information will be added here at least weekly on Saturdays. This was the initial post that started it all: Inspiration for Knitted Lace Shawls: Plant Anatomy. Shortly after the initial post, Deborah Ogden from Yarn Indulgences generously offered to provide yarn support for the project. I wrote more about the background of how Deborah works (and shared pictures of her studio!) in my article Behind the Scenes of Yarn Indulgences. A box full of precious yarn finally arrived in early February 2016. It included hand dyed skeins from Deborah, specially made for the Plant Anatomy project. The delay between the box arriving and publishing of the first four patterns in February 2017 was caused by myself only, as I was moving across the country in August 2015, and started Med School which didn’t leave much time for anything else. I started swatching straight away and the first two designs (Steel Teal and Cell Vortex) went smoothly. Design of the edging for Sage took the whole summer – I wanted to use a knitted on edging because I was not sure if I had enough yarn for an edging worked sideways. As I’m usually a fan of the latter I struggled a bit but finally created the Sage shawl pattern. Last October I got invited to speak at Austrian Yarn Club’s Wollness Weekend and took more Plant Anatomy projects with me: Green Linen (the sample shawl was finished but still unblocked) and the green sport weight yarn which would become the Wollness Crescent shawl. 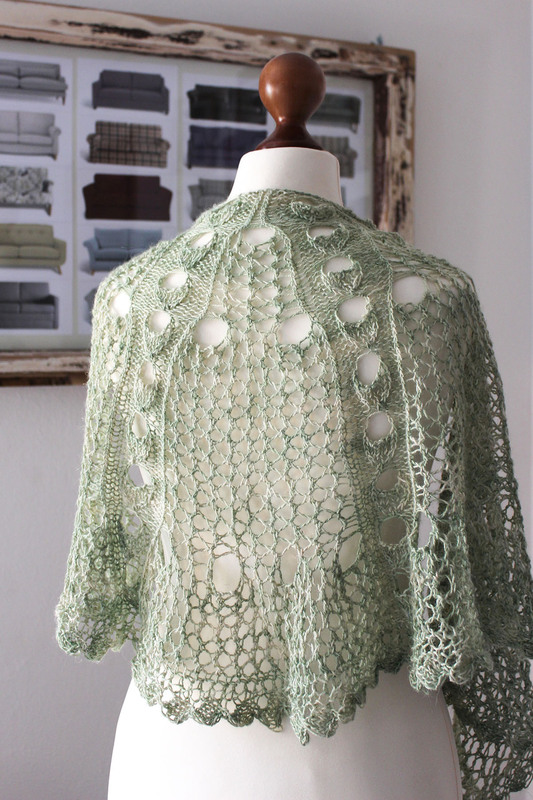 The Green Linen shawl is shown below. It has been released on June 11, 2017. 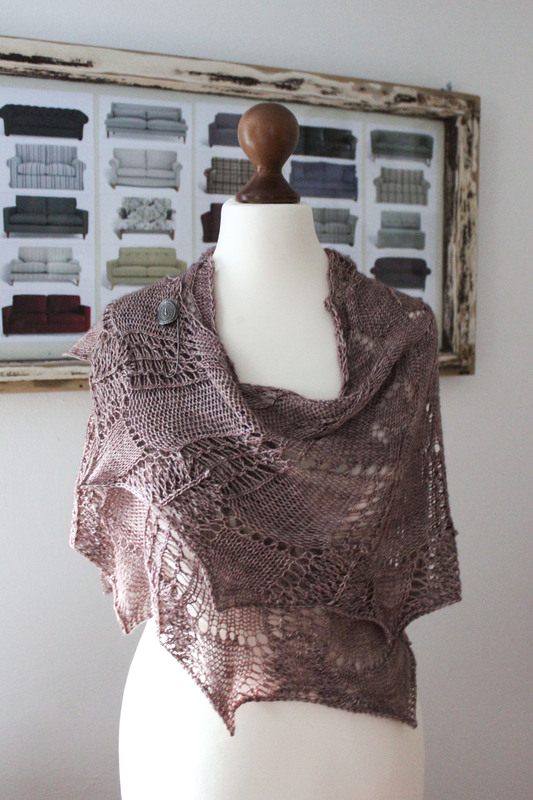 The sixth shawl design is called Mauve Shades and currently in the testing stage. 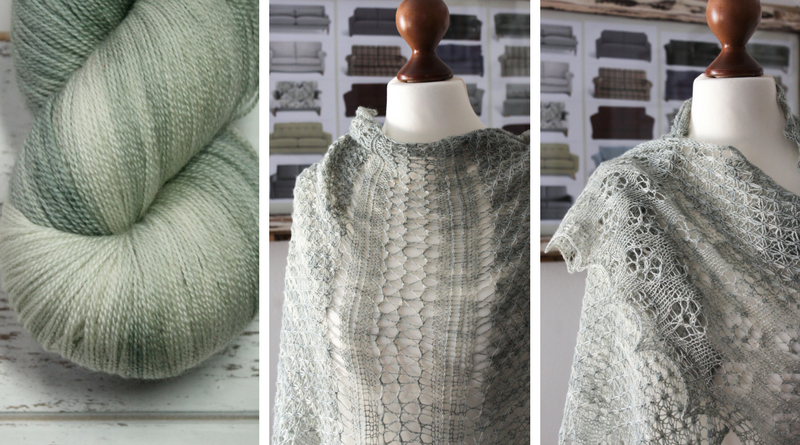 It’s a complicated, delicate lace shawl in crescent form designed without short rows. The shape and pattern combination makes it difficult to both knit and write the pattern so others can follow it easily, the testing process is not going very well at the moment to be honest. I need to to work more on it before it can be published. The prototype for Mauve Shades is shown below. 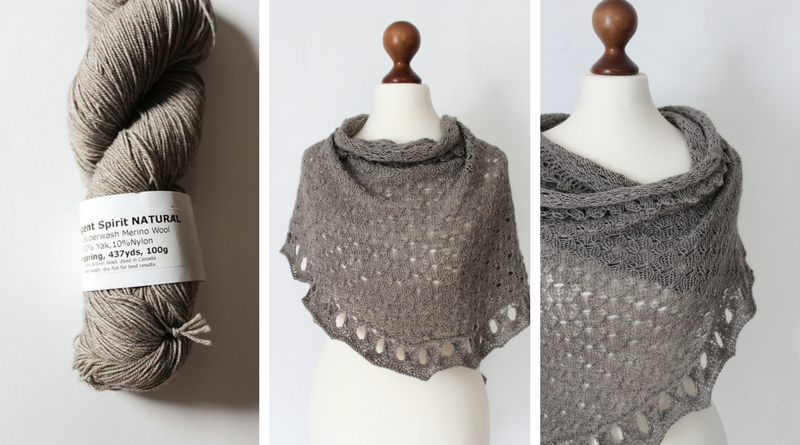 Shawl #7 is called The Indulgent Spirit, and #8 is called Allium Fog. Details can be found below. Shawls #9 and #10 will be unveiled later this year. The master plan is the following: create ten shawl patterns inspired by the 1680 book Plant Anatomy with yarn provided by Yarn Indulgences and publish them as a collection in book form. Document the whole process and compile this documentation into a handbook on how to create shawl design pattern collections. To create ten shawl designs I need to repeat my processes for shawl design and pattern creation ten times. So what the heck is a process? Find out about processes and check lists in How To Create A Knitting Pattern, Day 14: Knitting Pattern Check Lists. An overview about shawl design is provided in my free online course on shawl design, details about the design process and detailed instructions for each step are part of my online course Successful Shawl Design. Usually, this step is done separately for each shawl design. All graduates of my online course Successful Shawl Design know the importance of matching yarn, stitch pattern and shawl shape to avoid common pitfalls like stitch patterns getting lost in busy colorways, or gauge that doesn’t work well with the drape we want to achieve – to name just a few. 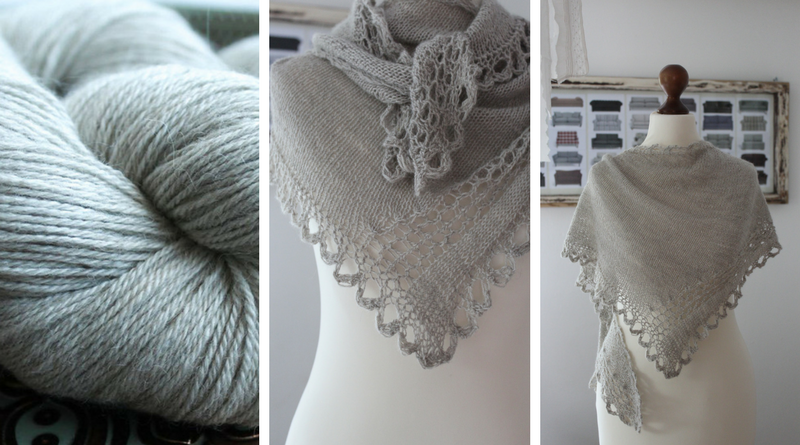 When I’m looking for inspiration for a new shawl design I usually start with either a shawl shape or a skein of yarn. (You can start with a stitch pattern too, but I rarely do). For this project, I have to make this decision ten times – once for each shawl design I’m creating – but luckily this time I have been provided yarn especially for this project so at least I don’t have to make color decisions. Two skeins of Yarn Indulgences Indulgent Spirit have become a crescent shawl without short rows, The Indulgent Spirit. 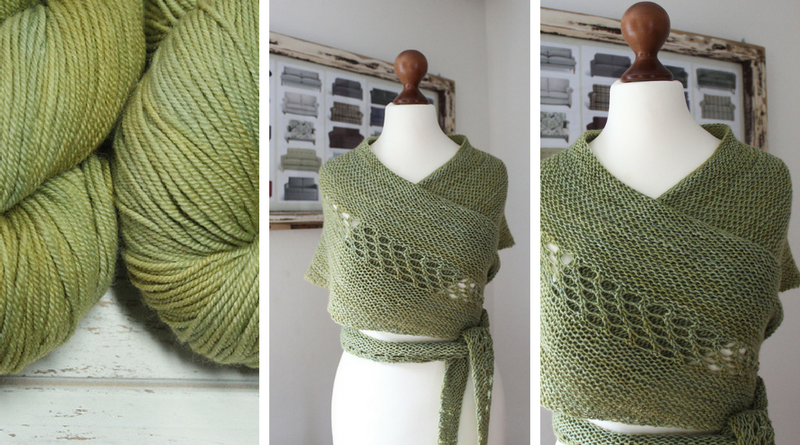 One skein of Yarn Indulgences Indulgent Loce have become a crescent shawl without short rows, Green Linen. One skein of Yarn Indulgences Indulgent Luxury has become a vortex (cornucopia) shawl, Cell Vortex. 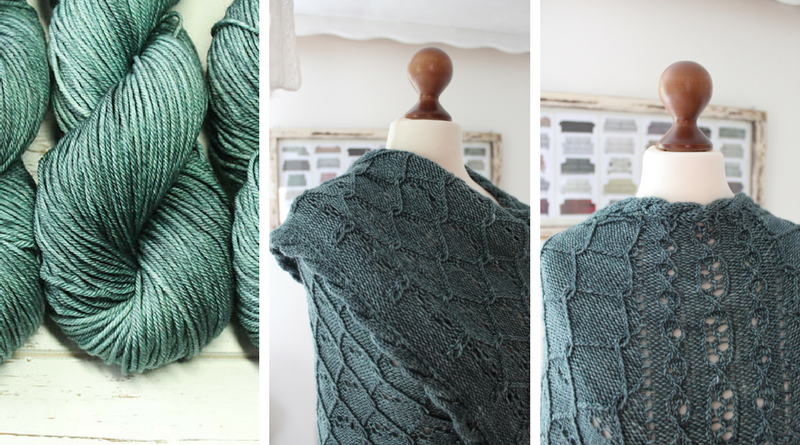 Three skeins of Yarn Indulgences Indulgent DK have become a winged triangle shawl, Steel Teal. Two skeins of Yarn Indulgences Indulgent Sport have become a crescent shawl without short rows, Wollness Crescent. 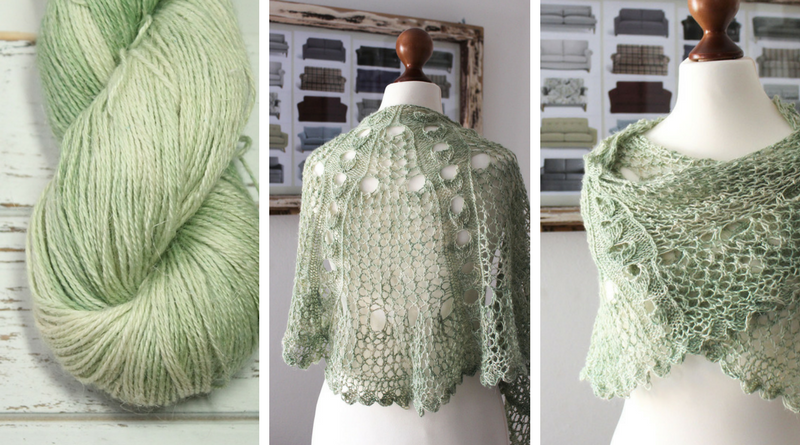 One skein of Yarn Indulgences Diamond Lace has become a lace triangle shawl, Sage. There are six more shawl patterns in the Plant Anatomy project. They will be added here as soon as they are available. Want to stay tuned? Testing and all other pattern related activities are coordinated in my Ravelry group, jriede knitwear design. Feel free to join us anytime! Pingback:Choosing Yarn for Lace Knitting: What About Colors? I love the new website. There is so much on it, and it’s so easy to navigate. Thanks! I only transferred about 10% of the content so far but it looks much better, doesn’t it? Easier to find the content! it’s as if i stumbled on a treasure box here! This is soooooo interesting, and the shawls are beautiful! Your scientific mind is so revealed in your intriguing shawl patterns. I truly am entranced by reading your words and viewing your patterns . Once again, Thank-you for all the patterns you so generously give. Best wishes for your coming exams!